Macedonian Interior Ministry has suspended 16 police officers because they failed to prevent violent penetration of Macedonian national protesters. 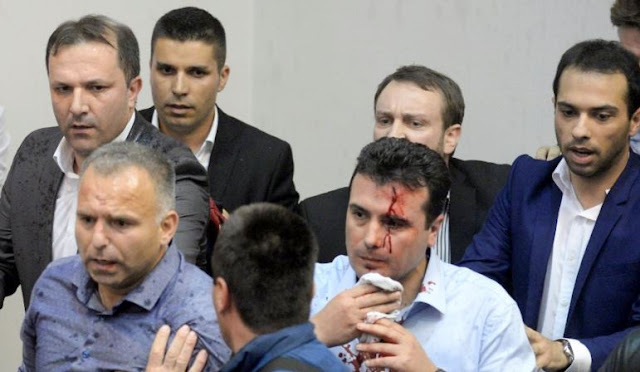 From the forcible occupation of the Macedonian Parliament on April 27 of masked people several lawmakers and journalists were injured, including the Social Democratic leader Zoran Zaev. After finally getting the mandate from the president, Djordje Ivanov, who for a long time refused to do so, Zaev is now trying to form the new Macedonian government. The attack on parliament was made after the appointment of the Albanian MP, Talat Xhaferi for the Speaker of the Macedonian Parliament. The names of 11 police officers, four members of the special police units and a ministry official are suspended because of "passively observing the protesters that entering and moving freely in the Macedonian Parliament... and has not helped other police officers."